Is Congress attempting to keep a check on the executive's foreign policy adventurism especially as we inch closer toward yet another unnecessary military intervention, this time in Venezuela? Or perhaps the better question is, when has it ever? Journalist Max Blumenthal recently went to Capitol Hill to find out with camera in tow. And like with Libya, Syria, or Ukraine before, it appears the greater the hawkishness, the greater the ignorance. 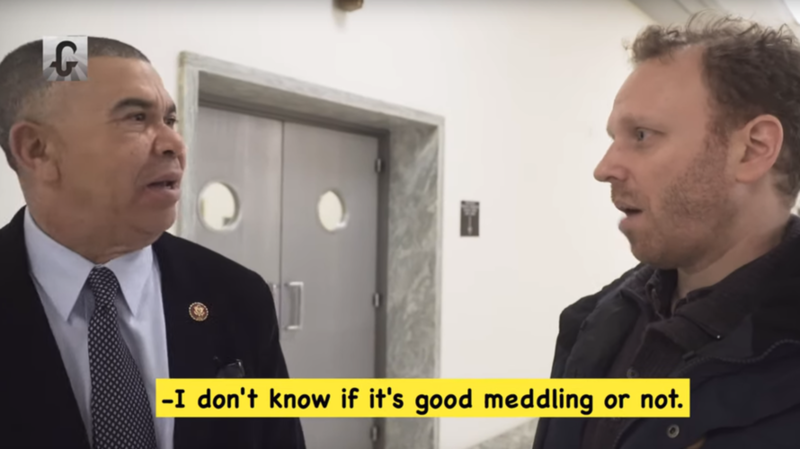 Blumenthal confronted Congressional members who admitted to US "meddling" in the Latin American country, but who can't figure out if it's "good meddling or not" — as one befuddled and confused lawmaker responded. The irony of course is that these very Congressional members, perhaps reflecting much of the broader American public, have been obsessed with alleged 'Russian meddling' in the US over the past two years yet don't give a thought when it goes the other way — that is, America's penchant for meddling in other nations, even to the point of military-led regime change and covert coup attempts. To meddle or not to meddle? Predictably it was a basic assumption among most political leaders interviewed by Blumenthal that Washington alone has a right to intervene, hence the laughable term bandied about the interviews — "good meddling". One Republican from Missouri, Vicky Hartzler, actually gave the classic simplistic and ultra-naive answer of "it's all about freedom" when pressed on the subject: “I think we’re just supporting the people and supporting what they are deciding needs to happen, and so I think it’s good of us since we are the bastion of freedom,” she stated. The responses from members of Congress painted a shocking picture of ignorance, hypocrisy, and bipartisan consent for the Trump administration’s assault on Venezuela. The scenes of politicians who are responsible for voting on matters of war and peace (insofar as anyone actually respects the War Powers Act at all these days) being caught off guard by fairly simple and straightforward questions on Venezuela reminds us of similarly appalling levels of ignorance surrounding the Ukraine debate in 2014 to 2015. As one Washington Post headline observed at the time based on hard data: The less Americans know about Ukraine's location, the more they want to intervene. And now insert most any third world country targeted by Washington over the past few decades. No doubt the same could be said about Venezuela now as US regime change efforts ramp up, which could quickly devolve into yet another proxy war (following dangerously on the heels Syria and Ukraine) between Washington and Moscow, or even Beijing. Unconfirmed viral footage from days ago.